This entry was posted on August 9, 2017 by piranha. In the UK the Street food sector has enjoyed phenomenal growth over the last few years. The Nationwide Caterers Association has seen remarkable growth in number of operators and many of the high street food chains we know today once started life as street food specialists. Street food is so important nowadays that many people will focus holidays and city breaks around where they can find the best culinary delights. With that in mind here’s our short guide to so locations in Europe you might wish to visit on a tour of Street food specials. London’s very own Borough Market, may have historical significance but it is as relevant today in the world of streetfood as it has ever been. The market is located next to London Bridge and plays host to some of the finest sellers of fresh foods anywhere in the UK. The mix of stall holders includes fishmongers, butchers, cheesemakers and chocolatiers. Stall holders at the market are required to have a strict environmental focus and adhere to the global slow food movement. In the heart of one of Europe’s most stunning cities the Naschmarkt fuses Eastern and Western European food cultures to provide an outstanding food experience. With a wide range of stallholders tourists can enjoy the delights of exotic fruit and vegetables from around the world, traditional Austrian meals or just sit back and relax in the coffee culture with something from one of the many delicatessens. No European food list would be complete without some kind of representation from the French and in classic style Le Marché Raspail brings together some of the finest fruit and veg with a touch of le chic. 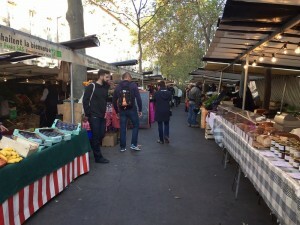 Located in the trendy 6th Arrondisement the market, which runs on Tuesday, Friday and Sunday can often, can often be a hotspot for food lovers and celebrities alike. If you are looking for streetfood in a party atmosphere then get yourself over to Berlin and make sure you visit Bite Club. The Bite Club springs to life once a fortnight, when stall holders file down to the side of the Kreuzberg River. Whilst revellers can indulge on a wide range of food and drink the party goes long into the night when the market transforms in to a party with a host of guest DJs. Mamma Mia, there had to be an Italian offering in this list of best streetfood markets and in Venice, you’ll find one of the freshest and finest anywhere on earth. The Rialto Fish Market is a hive of activity from 8am from Tuesday to Saturday every week, with punters descending on the stallholders to get some of the best bargains on the freshest fish. No one does food quite like the Italians so if it’s fresh you want then head to Venice. That’s our list of some of the best locations for street food in Europe. Markets are great for the very freshest culinary delights cooked right in front of your eyes. Have we missed anywhere? Let us know on our Twitter feed @cindersbbq.